Mike Zimmer's defense currently is best in the league on third down. The team that is last has a connection to Zimmer and just fired its defensive coordinator. NFL games, careers and lives change on third downs. The 53-year-old now-former Bengals defensive coordinator was fired Monday in Cincinnati. A day earlier, in a 51-14 home loss to the Saints, Austin’s defenders were bystanders as Drew Brees scored on every possession but the one he knelt down on — in Bengals territory — to end the game. The Saints converted 7 of 12 third downs. That dropped Austin’s third-down defense to dead last in the league at 56.55 percent. In the latest edition of the Access Vikings podcast, Ben Goessling, Andrew Krammer and Michael Rand discuss the Vikings-Bears wrestle for control of the NFC North on Sunday night, answer Twitter questions and more. Austin now has been fired twice in 11 months. And both times, the team that fired him had a winning record. As Lions defensive coordinator, he was let go along with Jim Caldwell when Detroit went 9-7 last year. The Bengals dropped to 5-4 with Sunday’s loss. The Bengals hadn’t changed their defense since Mike Zimmer seized control of it back in 2008. 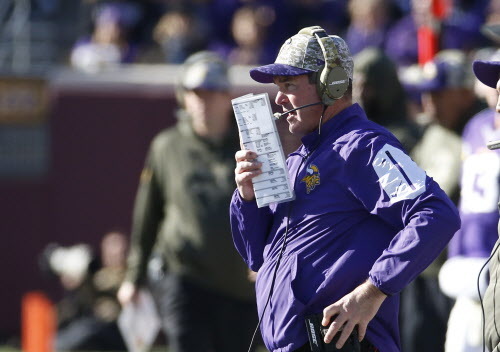 When Zimmer left to become Vikings coach in 2014, Paul Guenther was promoted to defensive coordinator. He kept Zimmer’s defense intact until leaving to join Jon Gruden in Oakland before this season. Austin came in saying the defense he’d run would be his own. So he made some changes. Nine games later, head coach Marvin Lewis had seen enough when Austin’s defense set an NFL record by becoming the first to give up 500 yards in three straight games. Lewis will serve as his own defensive coordinator and presumably will go back to the system he and Zimmer used. Meanwhile, Zimmer’s defense in Minnesota sits atop the league on third down at 25.74 percent.